Growing up, I have always wanted to have my home filled with animals. I was not picky about what animals, anything will do. I had Goldfishes - the body count was high!!! One dead fish every week. My parents refused to get me anything bigger incase I got bored which I tended to :p.
Then on my 8th birthday, my dad surprised me with 2 bunny rabbits!! I was the happiest girl that day. Sadly my rabbits died a month of each other. They died from injuries resulting from jumping out of this huge cardboard box (1 meter in height and 2 meters wide) we used as their home. After that, it was a bunch of terrapins, followed by budgies. I had 3 of them. My favourite was a big male budgie called Lucky. He was the best. Super affectionate, cheeky and super smart. He would be allowed out the cage and flew around the apartment and would never escaped. He would come to me and fluffed up his feathers to indicate he wanted a head rub. He eventually died of old age and so did the others. Guess I was better with birds than rabbits, fishes or terrapins. I had always wanted cats and dogs, but I knew my parents would not allow. So the moment I had my own place, I got my first cat. The reason I didn't get a dog was that I was still doing my PhD and it was not fair to have a dog and leaving it at home the whole day, while I was at school. So a cat was the best choice, as they are very independent. I started my search at the local SPCA in Glasgow, UK. I had my heart set on a tabby Tom, but sadly, all the tabbies were booked up. All that were left was a gorgeous big ginger boy or a black and white boy. The ginger was affectionate, while the black and white was rather aloof. Looking at their charts, it was revealed that the black and white had spent 3 months at the SPCA, came in with horrendous injuries and had to go in and out to the vets. My husband took sympathy towards him, so it was decided that we had to give this poor cat a home. After all the paperwork, he was handed over to us in a cardboard crate. I took a closer look at him, and what I saw was a large Tom cat whose 4 year old (estimated) face showed a lot of scars from living rough on the streets. We named him Tom. Once we got to our one-bedroom apartment, Tom jumped out of the box, went to sniff the cat litter box we set up for him and he found the bedroom, and the bed. Since then, I could never get him out of the bed. Everyone who had met him, remarked he looked like a tough street cat. He had all the scars to show for. What surprised everyone (from vets to friends) was how affectionate he is. And I love him for that. 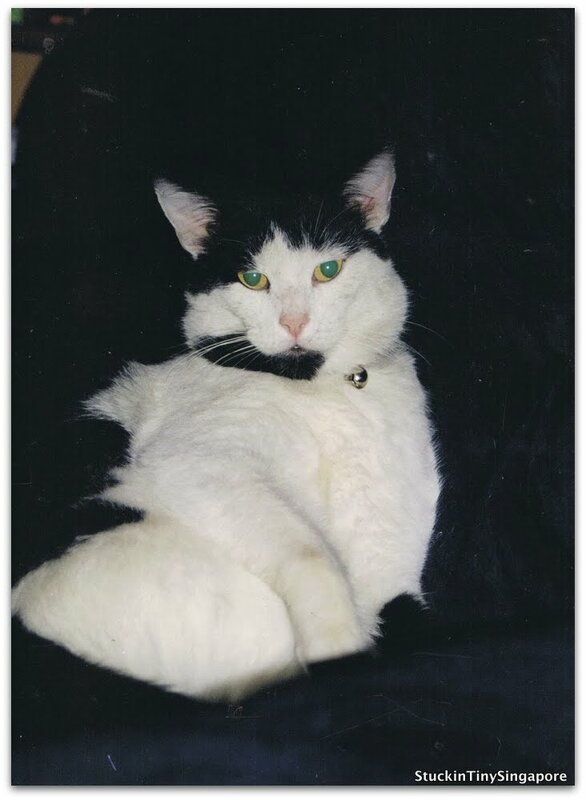 Twelve years on, I am happy to report that despite many health hiccups (he has heart murmur, urinary crystals problem), Tom is still healthy and happy. He has only a couple of teeth left, but still lives a good life (I hope he feels that way). He is now 16 years old, I wish very hard that he has many more years left and he is happy. We have moved from UK to HK to Singapore with him, and I hope we were right to bring him wherever we go.